Biblical Greek: A Compact Guide offers Greek students a one-stop guide for the grammar, morphology, and vocabulary of biblical Greek. This resource follows the organization and format familiar to the hundreds of thousands of students who have used Basics of Biblical Greek Grammar in their first-year Greek courses, but it is also usable by students who learned with a different grammar. By limiting its discussion to the "nuts and bolts," Greek language students working on translation and exegesis will more quickly and easily find the relevant grammatical refreshers. Students can, for example, check on the range of meaning for a particular word or make sure they remember how aorist participles function in a sentence. The paradigms, word lists, and basic discussions in Biblical Greek: A Compact Guide point students in the right direction and allow them to focus on more advanced Greek study. Biblical Greek: A Compact Guide will become a valuable addition to the reference library of seminary students and pastors. 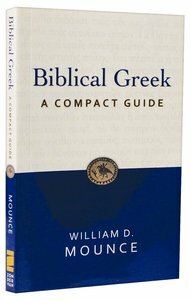 About "Biblical Greek: A Compact Guide"
William D. Mounce (Ph.D., University of Aberdeen) lives as a writer in Spokane, Wthe bestselling New Testament Greek resources, Basics of Biblical Greek, and served as the New Testament chair of the English Standard Version. ashington. He is the president of Biblical Training, a non-profit organization offering the finest in evangelical teaching to the world for free. See BillMounce.com for more information. Formerly he was the preaching pastor at a church in Spokane, and prior to that a professor of New Testament and director of the Greek program at Gordon-Conwell Theological Seminary. He is the author of the bestselling New Testament Greek resources, Basics of Biblical Greek, and served as the New Testament chair of the English Standard Version translation of the Bible. Others works include a major commentary on The Pastoral Epistles (Word Biblical Commentary); The NIV English-Greek New Testament: a Reverse Interlinear; Mounce's Complete Expository Dictionary of Old and New Testament Words and The Morphology of Biblical Greek.